i wonder if you can help or advise me on a repair to my Taylor accoustic guitar please..
i think i need a whole new neck replacement as it has snapped right where you have it in the picture but im affraid its worse than in your picture!! 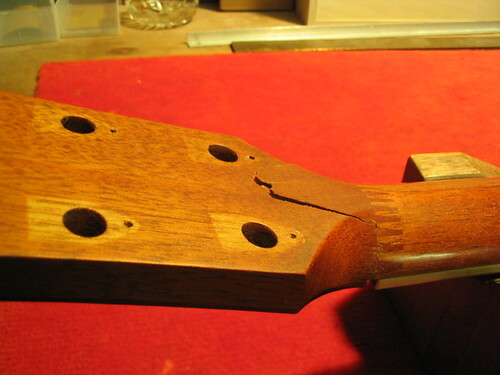 It would probably be best for you to email a few photos of the damaged neck; you may be pleasantly surprised as to what can be salvaged from a guitar wreck. My email details can be found on the contact page. Found you thru google when i searched for south london luthiers. Wondered if you might be able to give me some quick advice……its regarding my daughter who has a badly damaged santos acoustic spanish guitar to the neck, sound hold/front body (see photos). The guitar cost around £120.00 and i wonder if its worth fixing for the amount it will cost? if its too expensive it may be cheaper to buy another one?